Pilgrims Cottage01263 715779work01603 870304fax Self-cateringPilgrims Cottage is part of small exclusive holiday development, which has four other properties also available within the grounds. There is shared use of a heated indoor pool from 11.00am til 16.00pm each day, as well as a games room and gardens with an outdoor chess set and swing ball. If you do leave the grounds, then the sandy beach at Bacton is accessible down a private track, and the busier resort of great Yarmouth is a short drive away. 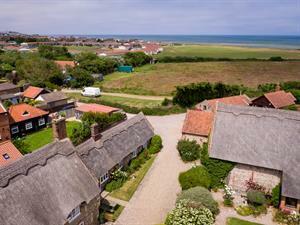 Pilgrims Cottage offers weekly bookings starting on Saturday. Pilgrims Cottage is part of small exclusive holiday development, which has four other properties also available within the grounds. There is shared use of a heated indoor pool from 11.00am til 16.00pm each day, as well as a games room and gardens with an outdoor chess set and swing ball. If you do leave the grounds, then the sandy beach at Bacton is accessible down a private track, and the busier resort of great Yarmouth is a short drive away.